This is a Huggies wet wipe case hand covered with gorgeous rose ribbon. 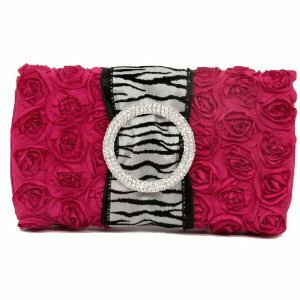 It is accented with Swiss satin, wired Zebra ribbon and a beautiful 2-3/4″ rhinestone buckle. Wet wipes aren’t just for dirty little bums. They are great to for older kids, gym lockers, to keep in your car, really for anyone that gets dirty. These are also used for so much more than just wet wipes. Ladies use them as clutches, receipt and coupon organizers, jewelry cases, pen holders. We also have a lot of brides order them to match their bridesmaids dresses and give them as part of their gifts. The possibilities with these beautiful creations are endless.